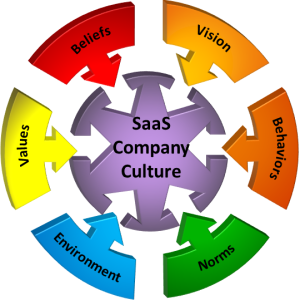 A SaaS company’s culture is a key determinant of its success. To grow a SaaS company really quickly, you need to create a product that customers can’t live without (the “Product/Market Fit”), delight your customers and ensure their success. This requires a superior company culture through exceptional, empowered, collaborative and motivated employees. The SaaS subscription model delivers a superior value proposition to the market compared to SaaP (Software as a Product) companies. Subscriptions empower the SaaS customer by providing higher quality and more flexible choices. SaaS changes how vendors operate requiring organizational changes. The culture of the SaaS business must make a different way of doing business possible. Churn is toxic to SaaS companies. If customers don’t receive compelling value, they leave. It is the certainty and growth of the recurring revenue that makes the SaaS business model superior to the product sale model – churn breaks the SaaS model. B2B software product companies often work to sell the “Big Deal” and then move to the next prospect. SaaS companies typically sell smaller, less complicated deals more quickly, and then expand greatly with each customer’s success. SaaS enables faster Time to Value and easier customer expansion to leverage new capabilities. The expansion of SaaS recurring revenue is a key driver of SaaS growth and leads to much greater total revenue over the life of the customer. The SaaS provider has continual responsibility for the customer’s operations. Since the SaaS vendor is running the software, they have the ability to see how the customer is using their software which enables them to determine ways to improve their customer’s results. The typical SaaS upgrade cycle of a few weeks or months (rather than every few years), drives greater interactions with the customer. The culture matters more with SaaS because these characteristics can’t be well executed without a superior, employee and customer centric culture. While there is no standard way of “scoring” the quality of a company’s culture the employee’s attitude shown in their willingness to recommend employment at the company is a measurable indicator of the satisfaction employees have of the company culture. There is a strong correlation between revenue growth of public companies and the percentage of employees recommending their company. SaaS companies with more employees who recommending their company, have greater growth. SaaS companies, on average, have a substantially higher rate of employee recommendations than product companies, indicating a higher level of employee satisfaction and confidence in the company. No public SaaS companies (with revenues above $100M annually) have negative growth. Only 2% of public SaaP companies (with revenues above $100M) have greater than 60% growth. The SaaS business model structurally enables higher growth than the SaaP model. See Why SaaS Companies Grow Faster than Software Companies. The focus on company culture is obviously not just a SaaS or technology emphasis. Non-IT companies, such as W.L Gore (Goretech), have focused on their culture for decades. Establishing a healthy corporate culture helps any organization, but it is essential for high-growth SaaS companies. SaaS companies need to be both extremely agile and customer-focused; this requires exceptional collaboration. The rapid SaaS product cycle and the lack of customer lock-in requires the SaaS company to be much more agile and customer focused. More Agile: SaaS companies must move quickly to create more customer value, respond to customer issues, and meet competitive threats. More Customer Focused: SaaS Customers may either expand or churn on any given day. The culture of customer focus must be woven into every aspect of the company’s culture. Driven by these requirements of agility and customer focus, a high-growth SaaS company must operate differently. Faster Paced: High-growth SaaS companies have a propensity for action and a rapid rate of change. Growth in itself drives the organization to a fast pace. A fast pace can only happen with employee empowerment and collaboration. More Long-Term Oriented: The SaaS business model is built on the value of the future reoccurring revenue stream, not the immediate sale. This requires a culture that focuses on making investments in the long-term value of the subscription revenue stream that increases over time as more value is realized by the customer. Less Political: Politics destroys innovation, growth, collaboration, customer success and employee satisfaction. Politics occur when departments and employees are destructively critical about other employees or departments. Politics occur when some voices in the company are more easily heard due to their connections. Politics are evident when people put the benefit of themselves or their compatriots above those of the company or the customer. The extent to which management enables or tolerates politics is evident throughout the company and is a clear indicator of failed leadership and a corrosive culture. Intolerant of Corrosive Employees: Life is too short to work with jerks. Management must not tolerate management or employees, regardless of their position or contribution, who demean other employees. It is especially critical that upper management is a constructive influence on the organization and they should seek independent assessments of their positive or negative impact on the culture of the organization. Unfortunately, too many senior leaders have no awareness on their impact on their company’s culture. They may react exactly in the wrong way if the company’s growth has stalled be creating a hypercritical environment leading to even worse company performance. Employees with persistently negative attitudes need to be made to understand their impact on the organization and coached to change. Corrosive employees who cannot change need to be removed from roles where they impact the organization. The SaaS company requirements and traits drive how the organization works at the individual level. If the leadership doesn’t trust the employees, they won’t empower them, they won’t solve the customer’s problems, and they won’t innovate. If employees don’t trust the leaders, they won’t be motivated to innovate, take prudent risks, or feel empowered to do “whatever is necessary” to ensure customer success. When employees don’t trust each other, because management doesn’t reward trust, collaboration will be reduced and the company’s results will be diminished. More Collaborative: A collaborative organization is a healthy organization. If an organization is collaborative, other culture attributes are usually healthy. A collaborative organization is rarely political. A collaborative organization is much more efficient, has much greater employee satisfaction, engagement, and personal growth. Collaborative cultures foster high customer satisfaction. Empowering: An agile organization gives the employee the ability to make the “right decision.” Employees will occasionally make mistakes, and the company must have a culture that accepts that. The benefit of empowered employees with a sense of ownership far outweigh the rare failure. The culture of the high-growth SaaS company supports the understanding that if there are no failures, the company’s reach isn’t high enough. Trust does not mean blind delegation; it requires coaching and clear goals setting. A culture of mutual trust is an essential trait of a high-performance culture. Central to building trust is the ability to admit mistakes. Leaders who deny their own mistakes, or worse, blame others, rapidly lose the trust and respect of the organization. Humility is essential to establishing a healthy culture. Values Employees: Commonly companies state that their employees are their most important asset, but their actions are inconsistent with these platitudes. One key aspect of showing the value of employees is to show the value of the employee’s time by eliminating much of the busy work that has very limited value. For example, companies that have lengthy, moronic approval processes for routine requests (such as expense approval) demonstrates the company neither has respect for their employee’s judgment, trust, or time. Wasting an employee’s time for processes widely viewed as unnecessary demotivates employees from working hard on what does matter. Companies with healthy cultures support their employees and their decisions. Leaders help employees grow, invest their time in open, interactive communications, and help employees during difficult times. Supporting employees as a cultural norm builds trust and loyalty while energizing the workforce. 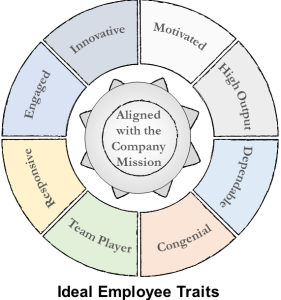 Company success depends significantly on the traits of its employees. The company culture can either support or detract from these traits. This occurs through recruiting and retaining ideal employees who fit into the company’s target culture, as well as assisting existing employees perform to their greatest potential. The starting point is to set the company’s mission, vision, and goals to give direction and purpose to its employees as discussed later in this article. A winning culture is one of engagement and individual contribution to an important mission and purpose. Human beings are not looking for company-bought goodies — they are looking for meaningful, fulfilling work. Motivated: Employees who believe in the company’s mission and themselves feel valued are motivated. Engaged: Motivated employees take responsibility and are committed to the task, the company, and its customers. High Output: Motivated employees who work in a supportive environment are just more productive. Dependable: In a culture valuing teamwork, employees make their commitments. If there is a problem, they let their colleagues know in advance. Hiding problems and delays is hugely negative to the company’s performance and its ability to satisfy its customers. Team Player: When employees feel supported and trust their colleagues and leaders, they work together better . Responsive: When employees work well together and want to help each other, they are much more responsive to helping wherever possible. Innovative: When employees experience the freedom to take risks and feel supported by the company, they become more innovative. Congenial: “Niceness” is contagious. Leaders, in particular, need to show congeniality and sensitivity, and resolutely expect that of all employees. Leaders should examine how the company culture either supports or detracts from employees embracing these ideal traits. As more employees embrace these traits, the entire company becomes a more fun and productive place. Great employees are much less likely to leave when they are growing, appreciated, don’t have to struggle with politics, and believe in the company’s mission. The vision the company creates should attract and inspire the people you want to employ. The environment, the opportunity to accomplish meaningful work, and the ability to grow will attract superior people. A great culture attracts great employees. Great employees will refer their exceptional friends to work at the company. A superior culture leads to engaged employees; engaged and empowered employees lead to happy customers. The relationship between employee engagement with productivity and customer satisfaction has been studied for decades. In 2003, the Corporate Executive Board found a strong correlation between Employee Satisfaction and Productivity, Performance, and Customer Satisfaction. A Gallup study showed Employee Engagement Drives Growth. The constructive attributes of engaged, empowered employees are even more important in SaaS companies where customer satisfaction drives more add-on sales and less attrition. When employees collaborate effectively with their peers it enables the agility for the SaaS company to thrive. Vision: where the organization wants to go together. Mission: what employees do together. Guiding behavioral principles: how employees are expected to behave. People must have a clear vision and mission to give meaning to their work. Employees need to understand how success is defined and understand why what they do matters. A Big Hairy Audacious Goal (BHAG), if credible, can drive people to achieve specular results. Because people perform best when they understand and believe in a cause, a cohesive workforce needs a unifying vision to be effective. The company’s leadership must be able to articulate and continually reinforce why what the company is doing is important. 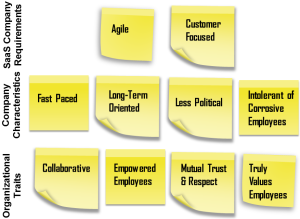 The employee goals and objectives follow directly from the company mission. Employee productivity and satisfaction are closely linked with having these well-defined goals. People need to have a well-defined definition of what constitutes the company’s and their personal success. A culture that doesn’t have clear goals will produce poor results. The crucial goals should be few and clear. If the company can rally behind three or four primary goals, it will be able to accomplish much more than having many poorly defined goals. The cultural objectives must be explicit and promoted by both its leaders and all employees. Goals such as an open door policy, opportunities for employee growth, and employee empowerment should be core principles for any set of cultural values. Leaders must model these standards or the culture they promote will fail. Companies must invest in their culture as they invest in all other activities of the business. This requires leaders to be accessible, work to meet the needs of the employees, and look for ways to foster cohesion and trust. Cultural values and their associated norms are only valued if they are reinforced and upheld by the leaders. Personal growth is a key objective of productive employees. With investments in the employees, not only does the employee become more valuable, but these investments build trust and mutual appreciation. While “perks” do not create a great culture, appropriately rewarding people demonstrates they are valued by company. It is impossible to have a great culture or great results without empowered employees. Once the mission, vision, and goals are set, the employees should be empowered to act. Openness reduces politics, makes employees more engaged, and promotes mutual trust. Accessible leaders resolve problems and capture opportunities much better. Employees are more satisfied and productive when their leaders are accessible. Great leaders are open to views of others and do not cling to old ways of doing things. Mistakes will be made, but when leaders can’t admit their mistakes and employees don’t feel safe to take responsibility for their mistakes it leads to a negative culture and poor company performance. Confident leaders admit their errors and take responsibility when problems arise. Without the ability to admit mistakes, organizations don’t learn. Companies that don’t learn, grow slowly. An emphasis on employee satisfaction and fulfillment does not guarantee every employee will perform acceptably. Leadership must ensure that the goals are well defined for each employee and team, and that the company has championed the achievement of those goals with a supportive culture and the necessary resources to meet those goals. Clear, early feedback should be given together along with the assistance in helping the employee meet their goals. If employees cannot perform at the necessary level despite the support of the company, their continued employment will be a drag on the organization and should not be permitted over the long term. “Slackers” damage the culture and are an affront to the work of the rest of the team. Employees who violate the crucial cultural norms such as destructive, secretive criticism of their co-worker should also be coached to change their ways or be removed if they will not change. Establishing a great culture requires addressing problem employees, not ignoring tough personnel problems. Perhaps the best known, worst practice in destroying cooperation is “Stack Ranking.” This practice pitted employees against each other by establishing a fixed percent of high and low performers. Helping a colleague excel could push you down in the stack. The consequence is that it’s not in the employee’s interest to help others on the team. Stack ranking was considered a prime factor for the lack of growth and innovation at Microsoft before it was abolished in 2013. Dysfunctional cultures correlate strongly with low growth. The hallmark of dysfunctional organizations is the lack of trust between leaders and employees breeding corrosive relationships throughout the company. An “every man for himself” attitude permeates these organizations. The lack of trust by management leads to the use of negative rather than positive incentives. There is often a lack of clarity of the company’s mission. Without a clear mission, less empowerment is possible since the objectives are less clear. Without mutual trust, management will micromanage their employees. Employees who don’t trust management focus on what will make them “look” best in management’s eyes rather than what is best for the company and their customers. Politics arise as employees and groups within the company compete in unhealthy ways. Why do Companies have Negative Cultures? No leader sets out to have a bad culture, but their negative behavior or simple neglect in fostering a positive culture causes poor results. Leaders of organizations with poor cultures don’t value or invest in their employees and focus on the short term. Establishing a great culture requires a long term commitment. Companies with poorer cultures obviously don’t have the attributes of those companies with good cultures. Leadership can start eliminating destructive processes such as Stack Ranking. Open to innovative ideas from employees & customers Trapped in the old way of doing things. Resists ideas of others. Humble leaders who can admit mistakes and are open to being challenged/take responsibility Lack of humility/Look for scapegoats on whom to pin problems. The characteristics of companies with poor cultures often make them blind to these problems – they become unable to make necessary changes. Micromanagement comes from a lack of trust in the employees and an unhealthy management obsession with control. Immature managers have difficulty setting objectives and then empowering employees to meet those objectives. Micromanagement stifles innovation and cripples agility by slow, bureaucratic decision making processes. Companies that are struggling resort to a short-term orientation of pressing employees to just “work-harder” and tend to resort to bad management practices such as micromanaging. This may have very short-lived benefit, but will impact employee motivation and drive away quality employees. Leaders must themselves model the precepts of the culture. Many companies have an enlightened code of ethics and values on their web sites. Those that espouse of high ethics and value of the employee, but don’t live by their own standards drive cynicism and distrust. For example, if agility is a key cultural attribute, leaders better ensure decisions are made quickly. If customer success is a key tenant, leaders should be seen as taking extraordinary, personal actions to ensure customer success. It is better not to publish these statements of ethics and values than to publish and ignore them. A political environment is one of the most damaging attributes of a poor culture. Poor leaders tolerate and often create, political environments. When companies run into major difficulties, the organization is stressed. Tough decisions have to be made, some with negative impact to employees; this is going to challenge the company culture. It is critical that there is shared sacrifice and openness about the circumstances and the plan to fix the problems. 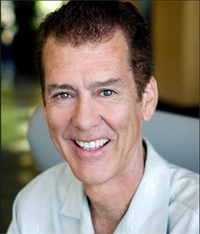 It is imperative to work toward employee buy-in to the course of action and communicate progress. Some companies may pivot their strategy and make constructive changes that lead to long-term success – going through difficult times can lead to a stronger culture. Other companies may stay in long-term “crisis mode,” focusing more on blame than resolution. These companies have terrible morale, high attrition and a corrosive culture; they generally don’t turn around successfully. The best time to create the optimal company culture is at the company’s inception; it’s much easier to start with a great culture than to change it. Early in the life of the SaaS company there is generally a strong vision and a cohesion of the founders; politics, which can strangle an organization, haven’t become entrenched. The challenge is to take the original energy and explicitly channel it into creating an optimal culture as the company grows. Explicitly defining how a shift to a SaaS business model changes the company’s mission, and moving on to redefining the company’s culture will help ensure a successful transition. Company cultures don’t improve without an event. It can be a change of leadership (Steve Jobs return to Apple), an existential crisis (Mary Barra at GM), or a change in the core business model (Satya Nadella appointment as CEO of Microsoft). Since SaaS companies must operate differently than product companies, this change in the business model necessitates changes on how the business operates. Changing how the business operates (and likely how it is organized), requires a new culture. The change to the SaaS business model provides a compelling reasons to establish a new, superior culture. Companies with low or negative growth, poor morale, or bad customer relations must examine their culture to determine if it is the root cause. Changing the company culture with the same leadership team is hard. It requires humility to accept the current culture isn’t working well, and an epiphany to make the hard changes. The median growth rate of public SaaS companies is 26% versus 8% for SaaP companies; the median public SaaS company has an Economic Value to Revenue ratio of 5.8x versus 3.1x for SaaP companies according to the Software Equity Group Q3 20015 Software Industry Financial Report. The potential of higher revenue growth and shareholder value of the SaaS model is what management and investors want. The flexibility, simplicity, and high benefits are what customers expect from SaaS. It’s the SaaS company’s culture that makes these benefits possible. It isn’t an easy journey, but the rewards are huge.